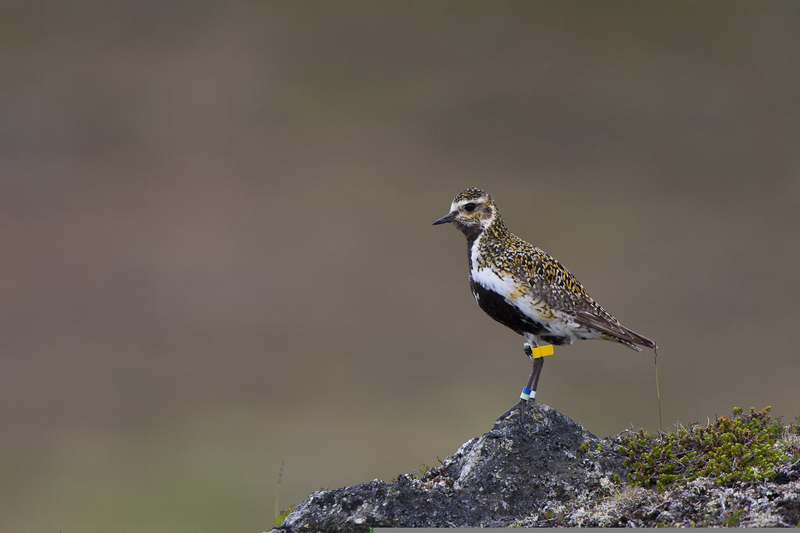 Since 2007, a colour-ring scheme has been used to enable individual recognition in the field of breeding European Golden Plovers in order to control breeding pair territories and get data on annual survival, pair and nest-site fidelity and breeding phenology. A different scheme has been used to adults and chicks. Left leg: Yellow flag on tibia and 2 c-rings on tarsus. Right leg: One colour ring on tibia and metal ring on tarsus. Left leg: One engraved green or yellow c-ring with an alpha code of two letters. Right leg: One green or yellow plain c-ring on tibia and metal ring on tarsus.